From the awesome Shelley Sly, I have received this colorful baby. Thanks Shelley :) Please check out this post by Shelley - it's beyond awesome! I'm sending this straight to Julie Dao. Love her blog, and today's post was one of my all-time favorite blog posts evah! A great follow-up to Shelley's post above, actually. I posted this one last week, but got it again from Hannah, Palindrome, aka P-Drome ;) Thanks girl. I'm going to send it along to Summer. Have a wonderful day, my bloggy friends. Congrats everyone and I'm totally with you on Julie's post. She's freaking awesomesauce for sure! congratulations on your other awards! Sorry for the double, I usually check for that but I got lazy. Congrats on your awards and to everyone who has received them! Congratulations to you and those you awarded them too!! Summer rocks my socks off!! Congrats on the awards :) Well done! Congrats on your awards - how fun! Tara how could I have missed this?! 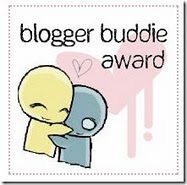 Thank you my dear *hugs* I love this award!!! !